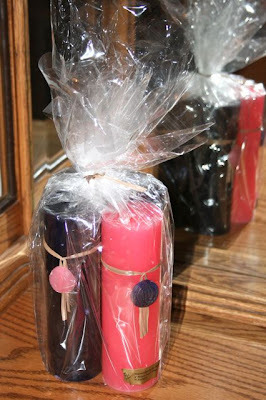 Do you have your Advent Candles yet? I now have ours, thanks to my mom! I called her a couple weeks ago and she happened to be heading out of town for a weekend retreat at a Monastery. I remembered that she had purchased her own Advent Candles (made by the Monks) there last year, so I asked if she could look for some for us, since I had not found any yet this year. (I've even been watching for them all year long since I prefer pillar candles to the tapers for our Advent Wreath.) Aren't they lovely!?! I sure wish our local stores would carry a wider selection of candles... Every year it proves to be such a challenge. Anyhow, I'd love to hear where you all have found your Advent Candles, this year or in the past! Your candles are beautiful! I would have a hard time burning them. I use the tall candles in glass. You know, the kind that often has a saint pictured on the front. I purchase them without any pictures at our local Catholic bookstore but I've also found them at Wal-Mart. They cost $1.50 - $3.00ea and they last a looong time. I keep them simple and only decorate them with ribbon. I switched to these because they are the most kid-friendly for my home. Our local Catholic bookstore carried this wreath and we thought we'd try it this year. Since it has colored glass chimneys we can use just plain white tea lights. That takes the pressure off having to find colored candles this year. Those candles are really beautiful ... and extra special since they were made by the monks! =) We used to make our own Advent wreath, too, and we used pillar candles. But with the little kids who want to touch the wreath all.the.time, I think it might be easier to switch to a permanent one. I have a hard time finding the pillar candles, too, though, so I will have to think of something FAST! Oooohhhh!! That is a really pretty wreath Charlotte! I love it!! I'm almost tempted to purchase it for next year. How lovely! Honestly, I usually go to the 99cent or Dollar store and buy some taper candles. Maybe we should head out and do that tonight so that there isn't any last min scramble.... thanks for the reminder! I've purchased ours at the Dollar Store in the past, and just haven't seen the shorter pillars in the right colors this year. Perhaps as Christmas gets closer... The next time I find them I am going to STOCK UP!! Last year someone suggested buying white candles and then melting the right color and dipping them to make our own... Which seems like it could be a fun project! Since we light the candles every night we burn through the tapers way too fast. The set from the Monks was less than $5 per candle, which I didn't think was too bad, since it was going to the Monks. =) Plus they should last all Advent -- though Lena is right, it will be hard to actually burn them. lol! Yes, I have been thinking about this too. The kids usually make our wreath at the Advent Event at our parish, but it dries out soooo fast, and the taper candles never last . . . so I have been wanting to do something else for awhile. I like that one Charlotte showed - I think I have seen it before . . . beautiful! I bought my candles here this year, and splurged on a wreath for the kitchen table. In previous years we have placed our Advent candles on the mantle, but I want something we will light every night as well. Lovely candles! 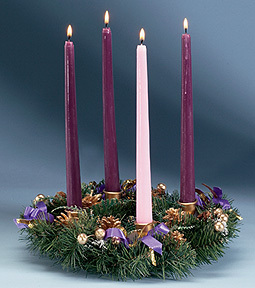 One year we purchased this kit for our advent wreath ( http://www.illuminatedink.com/products/2/14/623/ ) . The kids really enjoyed it and it came out nice. The only thing is that they do not last long. We like to light our candles every night with family prayers, but with these we had to cut it back to only lighting them on Sundays. We buy tapers - have bought them from www.autom.com in the past. I stocked up on a few packs last year when they were discounted after Christmas. We have a wreath similar to this one: http://www.catholicfaithstore.com/Store/Products/Item/-170/1/5-Porcelain-Advent-Nativity-Wreath_17868.html. It will only take tapers, which definitely burn down too quickly! We just light ours for about five minutes each evening at dinner so the candles will last! Thanks for the reminder that not only do I need candles I need to get my advent wreath out and figure out how to remove the candle that melted into one of the candle holders last year and broke off when I tried to remove it!!!! Jessica, can you tell us where your mom got your candles? They're beautiful! I'd like to order some like them. :) Thanks!!!! Tiffany, I read that if you put the candle holder with melted wax in the freezer and then place it under water when you take it out, the wax should just "pop" out! It might be worth a try!